Stephen I. 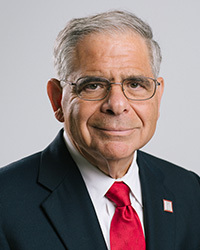 "Steve" Chazen was appointed to the University of Houston System Board of Regents in 2018 by Governor Greg Abbott and will serve through August 31, 2023. For fiscal year 2018-2019, he will serve as a member of the Endowment Management Committee, the Audit and Compliance Committee, and the Finance and Administration Committee. Chazen is chairman & CEO of Magnolia Oil and Gas Corporation. He retired as chief executive officer of Occidental Petroleum in April 2016 and served on Occidental's Board from 2010 to 2017. He began his career at Occidental in 1994. Before joining Occidental he was a Managing Director in the investment banking division of Merrill Lynch. Prior to that he was with Columbia Gas Development Corporation as Director of Project Evaluation and Reservoir Engineering. Mr. Chazen began his career at Northrop Corportion where he was a Laboratory Manager at the Johnson Space Center. Chazen is a current director of Ecolab, Inc. and The Williams Companies. He is a former chairman of the board of the American Petroleum Institute and a recipient of its Gold Medal for Distinguished Achievement. He serves on the Board of Advisors of Rice University's Baker Institute for Public Policy. Mr. Chazen is a member of the Senioir Cabinet of the President's Leadership Council and a Director of the Research Institute at Houston's Methodist Hospital. He is also a director and former chairman of the board of the Catalina Island Conservancy. He serves as chairman of the Finance Committee of the University of Houston Capital Campaign. Chazen earned his BA from Rutgers, a MS from the University of Houston-Clear Lake, and Ph.D. from Michigan State University.